Our fish-catching trip quickly becomes a fish-hunting trip, but that’s fine with us. Wife Zoe Ann Stinchcomb and I are interested in learning what the post-Hurricane Harvey fishing is like, and we encourage Hamilton to check out new places. A retired math teacher, he’s been fishing Aransas Bay for 40 years, the last 30 as a professional guide. He knows the bay as well as a dog knows the way to the feed bowl, but Harvey changed things. 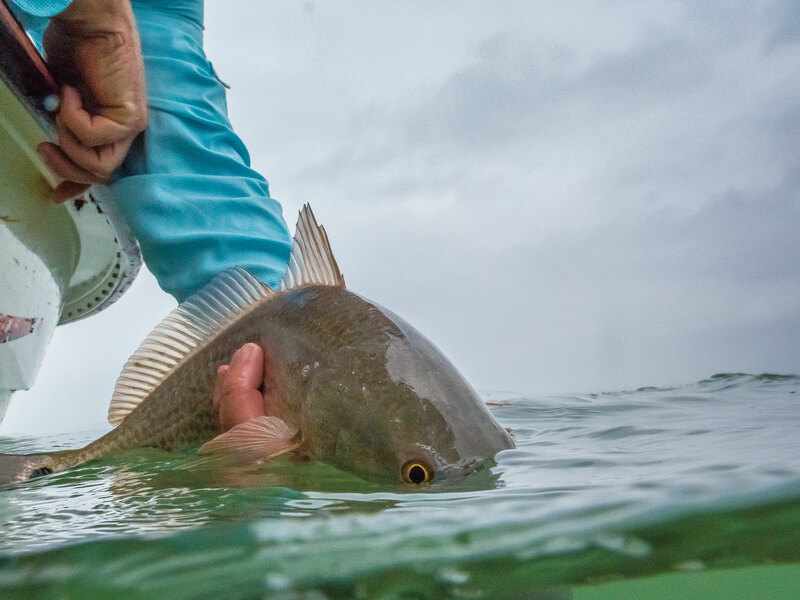 Anglers are having to learn the bay all over again. He gestures to two new cuts through Mud Island. Harvey’s eye passed just to the east of Rockport in August 2017 and went inland for several dozen miles before making a 120-degree right turn and going back out into the Gulf. As the storm moved on and the winds shifted, low pressure pulled the water back into the bay, and the storm surge came from the west. All those changes meant that many of the little squares on GPS screens marking fishing spots became useless, which is why Hamilton takes us up on our offer to look for new places to fish. Speckled trout like a sand bottom with some current, and all the changes in bottom contours mean water flow patterns in the bay aren’t what they were pre-Harvey. Hamilton reads the water as we move, keeping an eye out for jumping baitfish and birds diving on them. Not many birds are working, but we can see baitfish, and dolphins circling the boat confirm that fish are here. 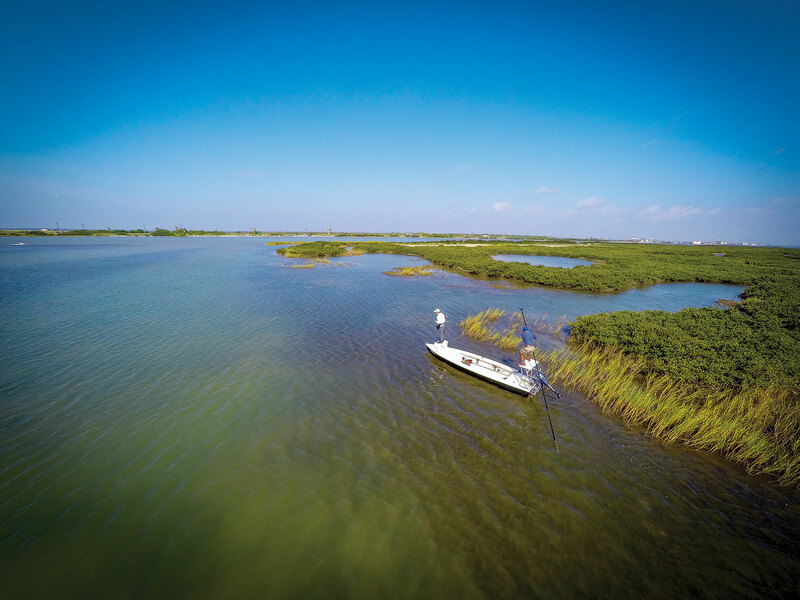 A quarter-mile away we see wade fishers with bent poles, so Hamilton lowers the Power-Poles and baits the circle hooks with live croakers hooked through the tail. Hamilton’s choice of spots is soon justified. My rod tip twitches insistently and then dips, and I set the hook. Or so I think. I reel in an empty hook. It takes several tries before I overcome the urge to rip the trout’s lips off, but finally I am rewarded with a nice 20-incher. Zoe Ann soon hooks up as well and lands another keeper. We catch a few throw-backs but box several trout above the 15-inch minimum. Then I reel in a hardhead catfish and later a gafftop, and Hamilton decrees it’s time to move. Several spots and several isolated trout catches later we’re behind Mud Island, and Hamilton needs to catch bait for the next day’s trip. He hauls out a cast net, and soon the deck is wriggling with 5- to 6-inch men-haden. We bag them up, put them on ice and head for a spot Hamilton calls the railroad trestle. It’s the location of a structure where trains came out into the bay to offload ships until the 1919 hurricane wiped it out, a re-minder that storms are nothing new to Rockport. The fact that we’re fishing at the spot is a reminder of something else: It’s the built environment that suffers most from hurricanes. In short, Harvey primed the pump, and fishing will keep getting better and better. Ironically, it’s fishing that keeps fishing great. But right now, the railroad trestle awaits, and the water is clear enough to see scattered patches of seagrass surrounding sandy bottom. Hamilton baits our hooks with dead menhaden heads from the previous day and puts the rods in holders. “If there are redfish around, they will smell it,” he says. It’s clear there are fish around — piggy perch. Our rod tips jiggle constantly as swarms of them nibble at our baits. Hamilton is pleased. “It puts sort of a chum line in the water,” he says. We wait. It’s hot. Hamilton fidgets. He has a writer on board whose job it is to tell people how great the fishing is, and it’s not up to his standard. 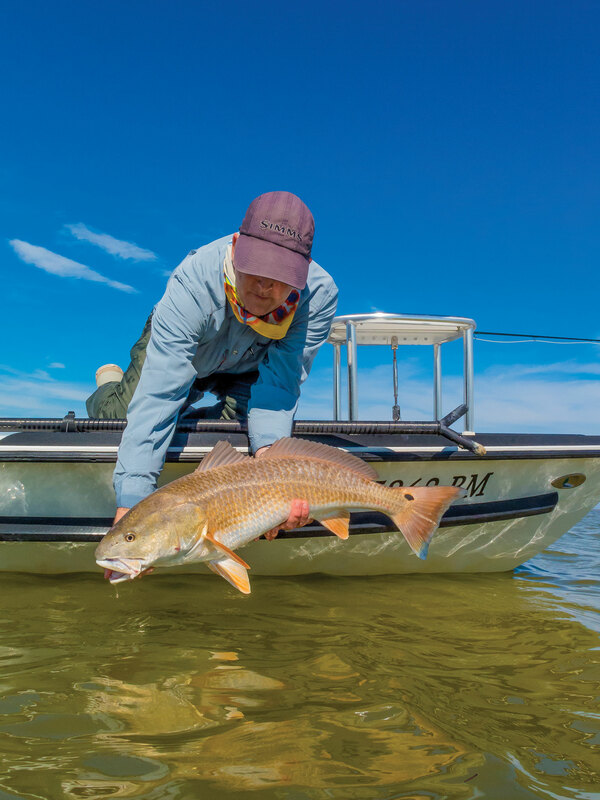 I can’t see much happening, but his practiced eye detects that a redfish has mouthed the bait and, as they often do, is swimming at the boat. “Grab that rod and reel as fast as you can!” he shouts. Zoe Ann obeys, the line tightens, and Hamilton orders her to set the hook. Shortly a redfish is jumping and running and making the drag sing. It pulls Zoe Ann to one side of the boat and then the other, tries to dive under the boat when she gets it close, and finally swims into the net. Protecting the small fish from harvest means more are available to grow to catchable size, and protecting the larger fish means more adult fish live to spawn. Remember: You want your children to be able to fish. Hamilton is a little chagrined when we end the day with eight speckled trout, two short of a two-person limit, and two redfish (both caught by Zoe Ann, I regret to admit) out of a potential bag limit of six. But we are completely satisfied. We have a hefty bag full of tasty fillets, a new set of Rockport memories, and a heightened appreciation for the enduring strength of the Texas coast, the staying power of the people who live there and the undying charm of towns like Rockport. Much work remains to heal the wounds of Harvey, but Jessee Pilgrim, our host at Pelican Bay Resort in Fulton, perhaps put it best. At the time of our visit in May 2018, repairs were still being made to some struc-tures, but the charming cottages had been completely redone inside and out. Laid out crazy-quilt fashion to fit into a grove of the windswept live oaks that define Rockport and Fulton, the refurbished cottages are hands-down the nicest place I’ve stayed in Rockport over the 30-plus years I’ve been going there. “The storm gave us the opportunity to fix things up that, frankly, after 17 years needed it,” says Pilgrim. That story is being repeated all over town. Harvey gave Rockport lemons. Rockport is making lemonade. Given the number of anglers and retirees you meet in Rockport, I’ve been guilty of joking that people go to Rockport for only two reasons: to fish and to die. But that’s not true; I say it only because a certain southern portion of my anatomy can be (and often is) described as smart. People go to Rockport to fish, yes, but more importantly, they go there not to die but to be reborn. Storm-battered as it is, Rockport teems with people in shorts, sunglasses, floppy hats and sandals, wielding fishing rods, artist’s brushes, binoculars and bird books. These people did not come here to die, they came here to live, to live the life they’ve dreamed of. A popular T-shirt bears the slogan, “Find yourself in Rockport-Fulton.” That’s good advice. If you’re not familiar with the works of artists like John Cowan and Herb Booth, go online and check out some of their paintings of the Texas coast. You’ll marvel at their ability to capture the subtle nuances of light, and wind, and water, and wildlife. But you’ll soon discover that there is one thing missing from all those paintings. It’s you. You need to fix that. Larry D. Hodge is a longtime contributor to Texas Parks & Wildlife magazine.